“A four cylinder? !” full-size truck customers will cry upon visiting their local Chevy truck dealer after this fall. In the half-ton pickup space, an engine with so few cylinders is unheard of. 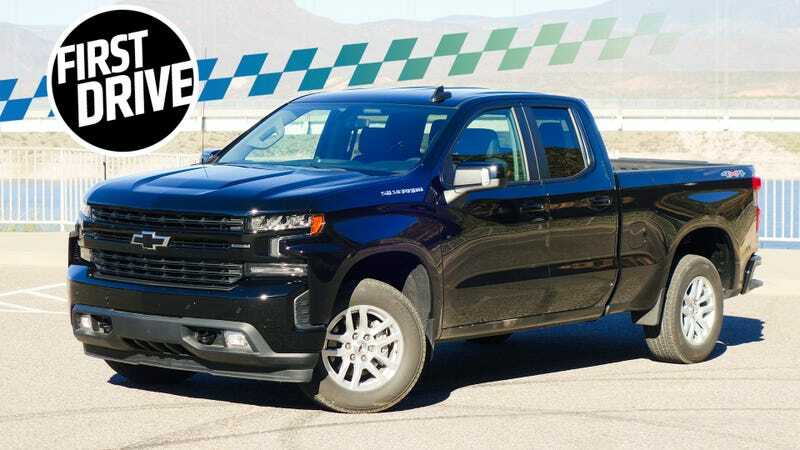 But after driving the 2019 Chevy Silverado 2.7 Turbo, I’m not sure it should be, even if I’m not entirely sold on this particular truck. It came as a bit of a shock to some truck lovers when Chevrolet announced that it was putting a 2.7-liter turbocharged inline-four into the Silverado. Antiquated views of four cylinder motors linger, and even though a number of automakers have offered four-bangers that crank out a robust 350 horsepower or more, it will still take time to convince truck buyers that it’s possible to be cool even if your truck shares its cylinder count with an economy car. The new Silverado’s 2.7-liter doesn’t quite make 350 ponies, but it’s still far from what powers your buddy’s Saturn. After driving around Phoenix and on rural highways, I came away satisfied with the output, but still a bit unsure about the value proposition, especially considering there’s a V8 option that scores better highway fuel economy for not too much more. American drivers are dropping absurd sums on pickup trucks these days, demanding more luxury and efficiency out of utility vehicles we seem to love using as daily drivers. That’s partly why you see mild hybrid pickups from Ram, many turbocharged models from Ford, and now a little four-banger from Chevy. Chevy itself readily admitted to me that the 2.7-liter “L3B” engine was driven in part by federal regulations, though the brand was quick to point out value to the customer: namely that this engine scores better combined fuel economy than any other Silverado motor at up to 21 MPG. That’s good as or better city mileage than most of the competition, and it still cranks out lots of power and torque. That’s 310 horsepower and 348 lb-ft of torque, to be exact—figures that are higher than those of any naturally-aspirated V6 in the full-size truck market. That applies especially to that torque figure, which peaks at a low 1,500 rpm. The power comes from an all-aluminum engine that’s got quite a bit of modern tech bolted to it—things like an electric water pump instead of a crank pulley-driven one, an electric coolant control valve instead of a wax-element thermostat, a sliding camshaft that can vary cam profiles and even cut off two cylinders for improved fuel economy, a variable oil pump, an integrated exhaust manifold with a turbo bolted pretty much right up to it, and plenty more. Standard on LT and RST trims and allegedly 80 pounds lighter than the 4.3-liter V6 it replaces, the 2.7-liter is a powerful and fairly large four-cylinder. The truck’s assistant chief engineer says the company went with that engine configuration over a V6 in part because of packaging constraints between the motor mounts and the turbo, which had to be placed in precisely the right spot for maximum efficiency. 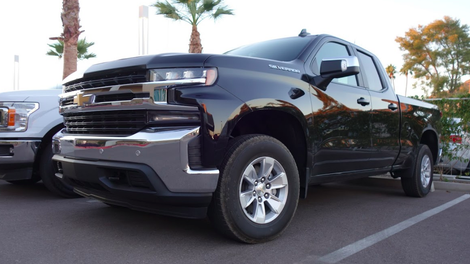 After driving around the Chevrolet Colorado ZR2 Bison for much of the day, Chevy gave me the keys to the black Silverado RST you see above, and I drove with another journalist through the Tonto National Forest between Phoenix and Flagstaff. Most of our route, during which I drove about two hours, involved steady-state driving on 60 MPH highways. In those conditions, the truck was solid. The cloth seats were comfortable, the ride was smooth (as was the road, admittedly), and that engine made plenty of power. Passing maneuvers on the highway, and accelerations from stop signs were quick. Chevy claims the truck can do zero to 60 MPH in 6.8 seconds, and that sounds plausible. The tach shows red at 5,500 RPM, but mash the gas, and the motor will rev even higher, hastily propelling the truck forward with a slight turbo whine and a pretty prominent high-pitched reminder that there’s definitely not a V8 under the hood. The low-end torque seemed plentiful, with the vehicle holding its gears well up inclines, and decent acceleration happening without the tach having to stand up too far from its resting position. All of that still applies here, and I still find the Ram’s interior significantly prettier. But I should say that this is a mid-level Silverado and not a luxo-Sierra. In this application, the interior is totally fine. (At least the dash is less egregious given that it’s not marketed as something more upscale.) It’s also worth noting that the chunky column shifter is deeply satisfying to operate. As for exterior styling, all of my initial reservations are gone and I’m now firmly a fan. Especially when wearing a monochromatic theme, the front end looks aggressive, yet handsome. That also applies to the back end. The tailgate logo isn’t just a plastic bit of trim or a decal; it’s stamped just as the truck gods intended. In the Silverado, especially on the highway, booting the pedal didn’t feel like it urged the vehicle forward with the same immediacy as the last Ram I drove. The culprit seemed to be mostly the Hydra-Matic eight-speed transmission that took a bit of time to shift. To a lesser extent, the turbocharged engine also felt at fault. It seemed to do a good job of building boost to prevent lag, but didn’t ever feel truly immediate. Eventually, the trans downshifted, the engine speed rose, and the truck accelerated. Then—strangely—I noticed that the tach needle would sometimes stop, then drop down a bit, before continuing on revving. It was a bit odd, especially since the pickup didn’t seem to stop accelerating during the pause. Also odd was the fact that sometimes the truck would continue to accelerate for a short moment, even after the driver had taken his foot off the pedal. This was something my co-driver noticed after smashing the gas pedal and letting off as the truck downshifted. I haven’t compared this behavior to other vehicles, so this may not be a big deal—it’s just something we noticed during our short drive. The biggest criticism of this four-cylinder motor since it debuted has been the official EPA fuel economy numbers. The truck is rated at 20 MPG in the city, 23 MPG on the highway, and 21 MPG combined for the two-wheel drive models. Four-wheel drive models score 19, 22, and 20 MPG in city, highway, and combined ratings, respectively. Some thought these numbers were unimpressive for a highly-touted four cylinder. Most of the figures are markedly worse than those of a 2.7-liter Ecoboost Ford F-150, the model that I once called the “best compromise between fuel economy and outright speed” in the F-150 line. That 2.7-liter V6 makes 15 horsepower and 52 lb-ft more than the Chevy’s inline-four of the same displacement, and still manages up to 20 MPG city, 26 MPG highway, and 22 MPG combined in two-wheel drive guise. A 4x4 model scores 19 city, 24 highway, and 21 combined. Even a base-model Ram 1500 DT will match the Chevy in the city, best it on the highway by 2 MPG, and beat it by 1 MPG combined. Chevy will tell you that the Ram makes a whopping 79 fewer lb-ft of torque and five fewer horsepower than the Silverado, and that the F-150 XLT with a 2.7-liter costs a bit more than the Chevy Silverado LT. The less expensive 3.3-liter V6 F-150 (which, if we’re honest, is a work-truck engine, not Ford’s most compelling option), Chevy points out, falls well short of the Chevy’s power and torque output. The Silverado LT also lists at about $200 cheaper, if anybody cares. And I think those are fair things to point out, and they show that—as a base engine—Chevy’s four-cylinder at least competes nicely with the rest of the pack outside of highway fuel economy. Still, the more powerful 2.7-liter Ford motor is only a $995 option on top of its base engine, and Chevy’s own 355 horsepower, 383 lb-ft 5.3-liter V8 costs just $1,400 more than the four, and actually scores 1 MPG better on the highway, though 2 MPG worse overall. Though I haven’t driven that V8 truck, I’d almost certainly be willing to drop those $1,400, especially knowing that doing so might actually increase my highway economy. Fairly comfortable. Not a fuel-sucker. Not going to blow any doors off, but quick enough. So in the end, what we have here is no surprise to anyone who’s been following the auto industry for the past decade or so: Thanks to technological advancements, four cylinders are capable of producing enough power to fulfill full-size truck duties. And this 2.7-liter engine does just that, with Chevy rating the truck as being able to tow 7,200 pounds and haul 2,280 in its bed. Still, to me, the truck is a bit of a hard sell. If you do a lot of stop-and-go driving, the Silverado 2.7-liter could be a good option, since it gets solid city fuel economy for the segment. But if you don’t prance around town much, I’d be tempted to just drop the $1,400 and snag a V8 that’s actually rated to get better freeway MPGs, sounds better, and likely responds a bit quicker to a pedal input. Obviously, real-world fuel economy and EPA ratings aren’t always the same. “Downsized” turbo engines have been notoriously prone to fail to meet test figures over the past few years, as Ecoboost owners could probably tell you. To come up with any real conclusion, here, would require more time in the truck. And if that time somehow reveals better fuel economy than the government’s numbers suggest, then this might be a winner. Because as far as drivability goes, the four-cylinder motor feels solid and up to full-size truck tasks.